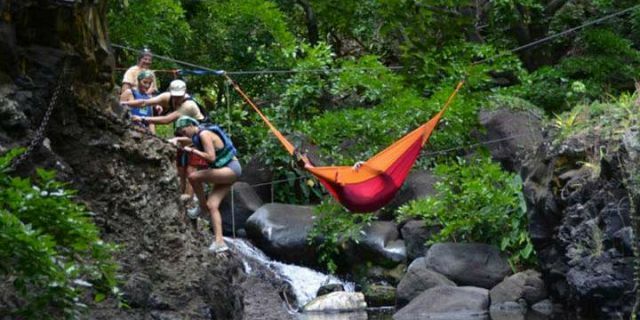 A day full of surprises and adventures! 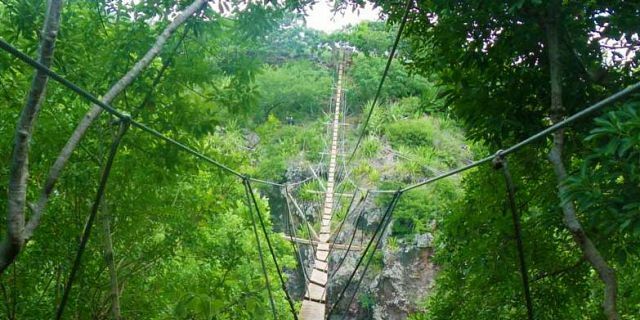 Wooden ladders, Nepalese bridges, knotted-ropes and lifelines make this hiking trip much more fun than a classic walk. 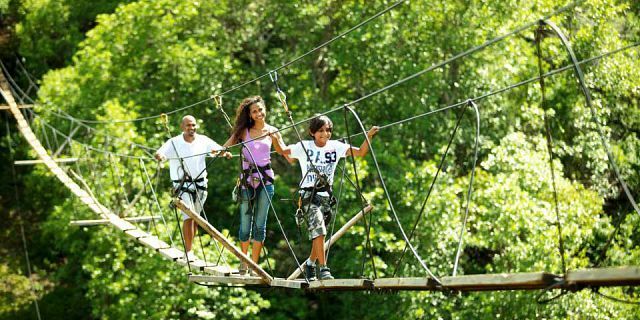 It is a full day excursion from 09:30 – 15:00pm, consisting of a range of fun activities where you will get to experience climbing on wooden ladders and knotted-ropes, cross Nepalese bridges over some of the park rivers, swim in a beautiful natural ponds, and even get to cross a full width canyon on a double ziplines of 165m! 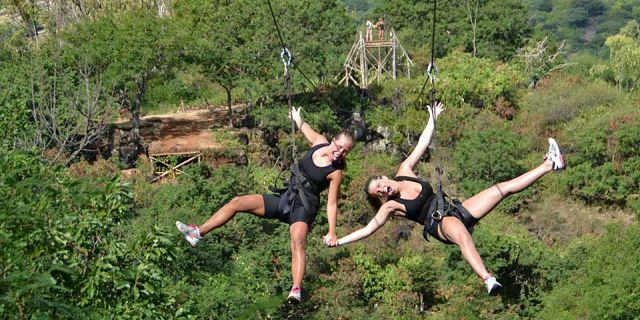 This zipline hiking trip offers an excellent mix of activities to surprise the participant and make it an excellent alternative to a day on the beach. 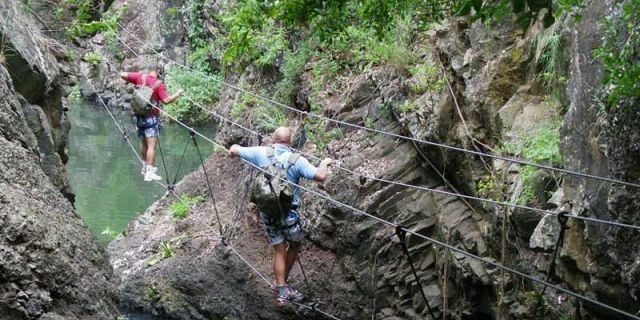 The trip starts with hiking through this beautiful natural park where you will get to experience climbing on wooden ladders and knotted-ropes, cross Nepalese bridges and enjoy swimming in a natural pond of fresh water with a waterfall. 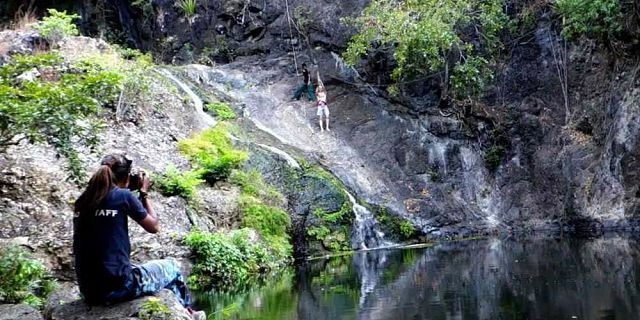 At the swimming pond you can relax under the waterfall or have fun with the zip line while the guides and team prepares the picnic / BBQ grill lunch. 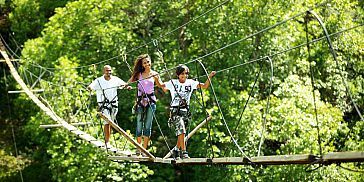 The food will then be served on a wooden platform located on the trees, which provides you with a great view while you eat. 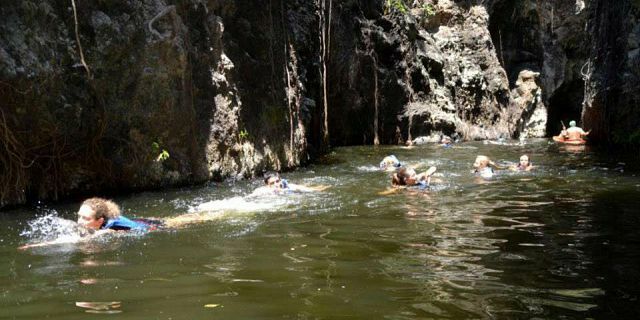 After lunch, you will swim through a canyon followed by a slide down a twin zip line of 165 meters over the canyon. 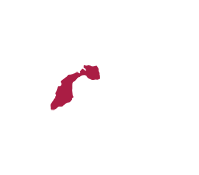 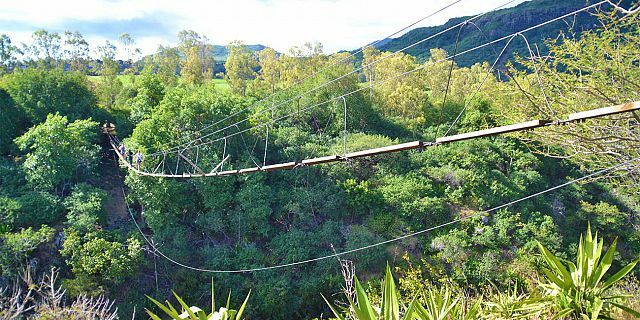 All along the professional guides will tell you about the fauna and flora, and will keep a very fun atmosphere with their inimitable local humor. 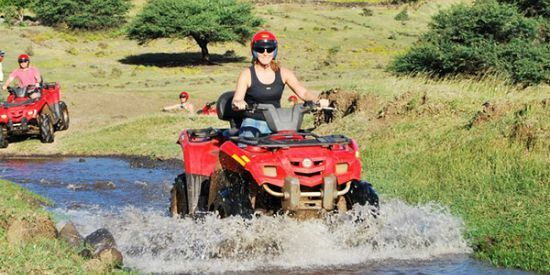 Frequent maintenance work, including safety gear and following strict safety regulations, all guarantee maximum safety for all visitors. 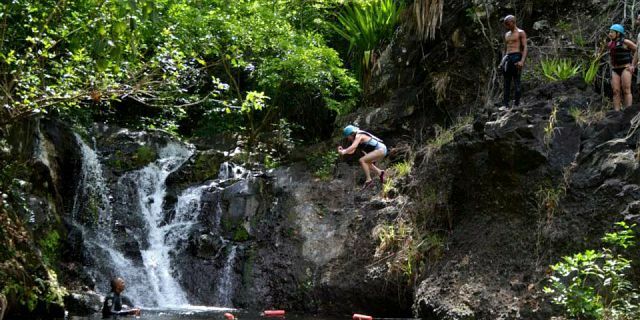 This ziplines excursion includes picnic lunch at the swimming pond + water and soft drinks. 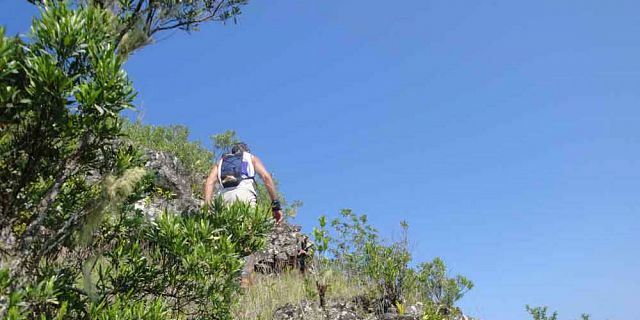 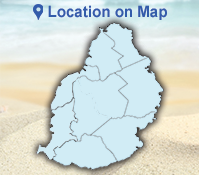 About the Yemen natural reserve park – the park is located on the West Coast of Mauritius. 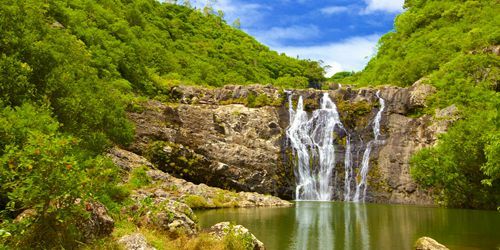 It hosts two of the longest rivers of Mauritius – Rivière Rempart and Tamarin River – and is a haven for all sorts of native wildlife. 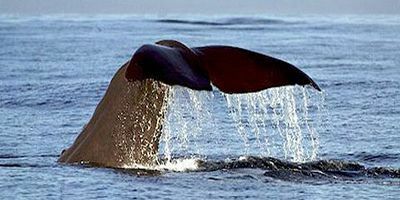 The actual size of the natural reserve is of around 4500 hectares. 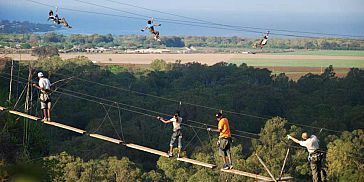 Important: The Hiking with Ziplining trip is done at the Yemen Reserve which is part of the Mauritius Safari and Bird (Casela Park). 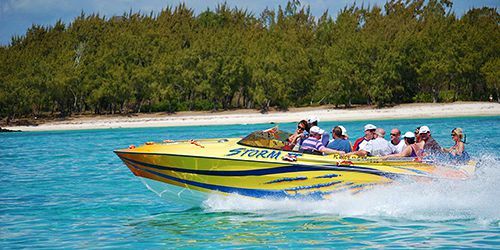 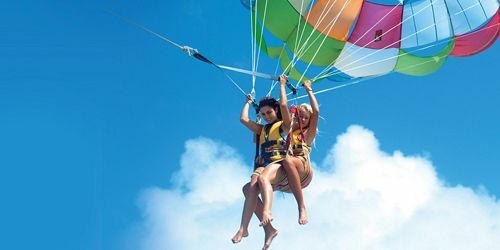 In order to take part in this trip you will have to enter the Mauritius Safari and Bird Park. 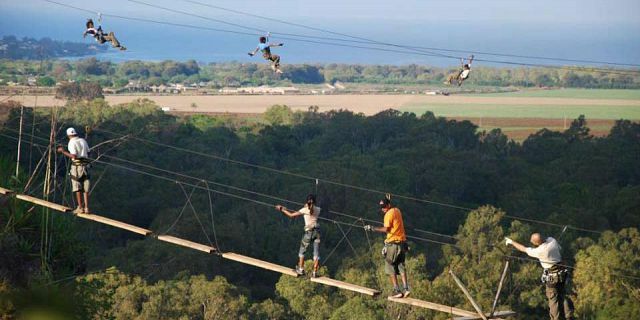 Accordingly, we offer you to purchase together with the Hiking and Ziplining trip, also the entry tickets to the park.